All of these berries are free medicines and foods in their own right. All three have an antioxidant properties and are able to help us adapt to changes in our immediate environment, be it caused by stress or dietary imbalance. Antioxidants oppose the free radicals that are implicated in cell damage, enhance the immune system response to invading pathogens and reduce the effect of stress as well as protect the heart. Antioxidants protect us from, amongst other things, the signs of aging, degenerative diseases, senility and rheumatic conditions. Hawthorn berries (Crataegus monogyna and oxyacanthoides), known as ‘haws’, are a mild sedative to a nervous system, through their nourishing effect on the heart. When the heart is well nourished it works in more regular fashion, and without palpitations or cramping chest pain. Hawthorn is known for its antispasmodic (muscle relaxing) and cardio-tonic (heart nourishing) effect. Hawthorn relaxes the heart blood vessels (the coronary arteries) and enhances the supply of fresh oxygenated blood to the heart. There is an additional effect attributed to it too – lowering blood pressure. A well nourished heart is said to be a resting place to our spirit, and our sleep patterns reflect the state of the heart. Restlessness and insomnia of any cause reflect a negative a heart in need of nourishment. In traditional herbalism, hawthorn is indicated in functional heart disorders like heart weakness, arterioscleroses and palpitations, as well as nervous stomach disorders and mild insomnia. 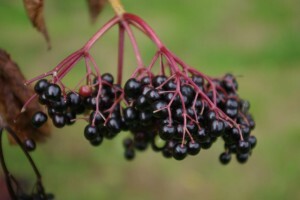 Elderberries (Sambucus nigra) when fully ripe are sweet and pungent. Their therapeutic activity extends to our immune system. Elderberries are source of very potent phytonutrients especially dark purple pigments, called anthocyanines, that give it the almost black appearance. Immune function in the body is enhanced by the anthocyanines present in elderberries because they can boost the production of proteins known as cytokines that act as messengers in the immune system healing to regulate immune response, and thus to defend the body against disease. Elderberries are beneficial against the viruses that cause flu as well non-flu viruses such as herpes and Epstein-Barr (associated with chronic fatigue syndrome or ME). They are also famous for their stress reduction activity. Research has shown that elderberry extract can significantly shorten recovery time from physical exertion and significantly reduce the effects of stress. When picking your elderberries, remember no stalk is allowed (it can be toxic) and do not eat too many fresh fruits, as this can lead to diarrhoea. Blackberries (Rubus fructicosus) are true free food from heaven. They are at their best at this time of year and once they are gone you will have to wait for another year for them to return. As soon as the weather begins to get more damp, the blackberries become susceptible to molds and should not be eaten. Their dark purple colour indicates presence of powerful antioxidant pigments. Blackberries are best eaten on the spot. The way to preserve at least some of their special contribution to our health is to soak them in cider vinegar. Place 100g of ripe, firm, clean, mold-free fruit, into a glass jar and cover with enough of organic cider vinegar to immerse all the fruit. Leave it to infuse for 3-4 weeks, strain the liquid off and decant into a clean glass bottle, close the lid, label with name and date (the pickled berries that are leftover, you could serve as an accompaniment to a meat dish). Your blackberry vinegar can be used to season your food – for instance in salad dressings, or as a refreshing detoxifying drink. Use 1 teaspoon to a glass of cold water. This vinegar, used as a gargle, is great remedy for sore throat and mouth inflammations, it can be used as a skin toner, diluted in a little water. Vinegars like this are great skin rinse, for toning and energising dry and normal skin, and to clear skin blemishes and inflammation. The same vinegar can also be made with hawthorn berries and elderberries. For a great way to use autumnal berries see our recipe for Early Autumn Rambler’s Delight – a delicious smoothie packed with antioxidants. The late Dragana Vilinac was chief herbalist at Neal’s Yard Remedies.